This is the first SRC post of 2014. After a month off, a well-timed break, we are back at the club. I was so very excited when I got my assignment for this month - a blog called Cupcakes with Sprinkles. Seriously, how cute a name is that! This blog is authored by Meghan. Meghan and her husband just recently celebrated their 7th wedding anniversary and they have 3 adorable little kids. While being a loving wife and mother, she also finds the time to bake, cook, blog and quilt and runs her own Etsy shop. Don't forget to stop by her blog and show her some love. Now true to its name, you'll find heaps of cupcake, cake and dessert recipes on this blog. But you will also find some very tempting savory recipes too. I felt I had to try out one of her cupcake recipes and while it was hard to pick, I settled on the Cookies N Cream Cupcakes. These were really easy to make. I love that I have access to an oven again and I'm finally baking again, after more that 6 months. And these cupcakes did not disappoint. The cake itself had a beautiful delicate crumb and the frosting was beautiful. For me the frosting was the absolute star. I'd probably cut down the sugar in the cake itself a little the next time I make it, but thats just a personal preference. The recipe is fine as is. Now that I've eaten a 2nd, maybe even a 3rd one ;), I think the sugar level is just fine, I will stick to the original recipe. We thoroughly enjoyed it with our afternoon cup of tea. Thanks Meghan, for introducing me to a wonderful cupcake recipe. Preheat the oven to 170ºC. 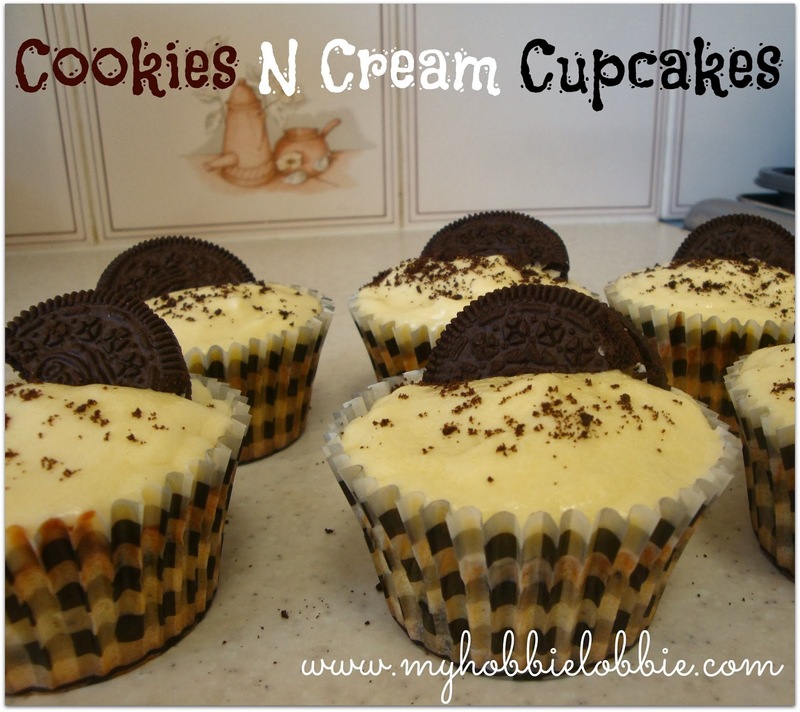 Place cupcake liners in the cupcake tins and place one Oreo half in each liner, cream side up. Place the flour, baking powder and salt (dry ingredients) in a bowl and stir through with a fork and set aside. Add the egg whites, one at a time, beating between each addition. Add the vanilla essence and beat again till incorporated. Add half the dry ingredients and mix until just incorporated. Add the milk and again mix till incorporated and then add the rest of the dry ingredients and mix till just combined. Gently fold in the coarsely chopped Oreos. Do not overmix. Spoon the batter into the cupcake liners and bake for 18-20 minutes or until done. Test by piercing the center with a toothpick or a piece of uncooked spaghetti. If it comes out clean, the cake is cooked. Let it cool in the pan itself for about 5 minutes after taking it out of the oven, then transfer to a wire rack to cool. Once it has cooled completely, you can proceed to frosting the cupcakes. Combine the cream cheese and butter using an electric whisk, on high speed, until smooth. Add the powdered sugar and beat till smooth. Add the heavy cream to the mix on low speed till mixed and then on med-high till stiff enough to frost with. Frost the cupcakes as desired. You could sprinkle the top with some Oreo crumbs and half an Oreo. Love the look of those cupcakes. And they must be delicious! Cookies and cream is one of my fave ice cream flavors. I know I'd devour your cupcakes in no time flat. :) You know, strangely I dont care much for the ice cream version, but these I loved! Thanks for stopping by Lisa! These look like pure heaven! Beautiful recipe and photos - great choice for the SRC! They look amazing! I'm so glad you found something delicious. I always think about cutting down the sugar in my recipes and then I figure, its dessert its supposed to be really bad for me. Haha. I'm excited to look around your blog! I see cupcakes in my future! Thanks for sharing with the SRC. I like the look of that future Camilla :) Thanks for stopping by! I love Meghan's blog and these cupcakes make my mouth water. Great pick! oh man. what great cupcakes! perfect for SRC! I'm all about cookies and cream. Got milk. Oh yummy! What great cupcakes! That frosting sounds amazing. Thanks Lesa, thats the first time I've had Cream Cheese frosting ... I know, have I been living under a rock!!! But theg frosting was great, loved it! Those cupcakes look like something out of a bakery! Thanks for stopping by Kirstin! Amazing and delicious looking oreo cupcakes.